I’m so freaking excited about going to my first Feast Portland, Sept. 13-16. I’ve never been to the mega food fest before because this epic event is OVERWHELMING. There’s just too much going on. How do you decide when you want to do everything? It’s like going to an all-you-can-eat buffet at the French Laundry. But after carefully studying the ultra-packed schedule, I think I’ve got a plan. Not surprisingly, quite a few on my essential list feature Seattle chefs. See y’all soon, Mark Fuller, Edouardo Jordan, David Nichols, Kathryn Olson, and on and on. Take note, many events are sold out, but there’s still some availablity. Here’s my game plan. The ‘80s vs. ‘90s smackdown on Thursday evening seems like a perfect place to dive in, a friendly competition of throwback dishes made by 20 amazing chefs, including barbecue legend Aaron Franklin from Franklin BBQ in Austin, Texas. Seattle magazine is a sponsor; dining and lifestyle editor Chelsea Lin will be one of the judges. 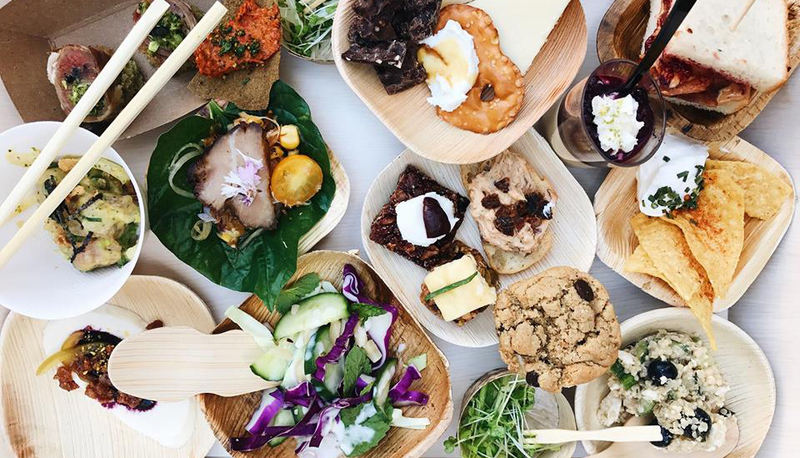 On Friday, I’m heading to the afternoon Grand Tasting, and in between bites, I’m going to make a beeline to the 1:30 p.m. fireside chat with one of my heros: Southern food superstar Sean Brock, before hitting up Big Feast in Little China. But, wait, I also want to save room for the dinner featuring Han Oak and the fabulous Angie Mar from The Beatrice Inn. Darn, it’s sold out, as is the main event that night, the Ring of Fire-themed Night Market. Anybody seen my fat pants? Because I’m gonna need them for Saturday’s Brunch with Benefits featuring one of the hottest chef on the West Coast, June Baby’s Edouardo Jordan. Do you think he’ll be trotting out his famous fried chicken? Hope so! Then, yes, please, to Rose All Day at the Rose and Macrame class. (Because tispy crafting is the best.) Nouveau Bistro bash is next, which showcases some fab French Beaujalois with classic and new world creations from an impressive lineup of chefs including JJ Proville from L’Oursin. I’m setting the alarm early on Sunday so I’m first in line at Brunch Village, which is sponsored by Bob’s Red Mill, so I’m going to load up on grits for sure. Then I’ll stagger across the four super-filling-days-of-feasting finish line at Feast Sunday Tailgate. Yes, there’s so much more to do and see and eat, but there’s always next year. Seattle magazine is a media partner for Feast Portland.